Performers include: Clive Standen, Jennifer Beals, Gaius Charles, Brooklyn Sudano, Monique Gabriela Curnen, Michael Irby, James Landry Hébert, Jose Pablo Cantillo, Simu Liu, and Ali Kazami. A prequel set thirty years prior to the Liam Neeson feature film trilogy, the Taken TV show stars Clive Standen as a younger, hungrier former Green Beret, Bryan Mills. After a personal tragedy upends his life, he embarks on a quest for vengeance, as he struggles to move past the trauma. While working as a CIA operative, Mills hones his infamously lethal skill set. In Special Deputy Director of National Intelligence, Christina Hart (Jennifer Beals), he finds an important mentor and protector. Bryan’s OPCON team includes the light-hearted Dave (Jose Pablo Cantillo), who never takes anything too seriously, at least until it is. Then there is John (Gaius Charles). A leader by nature, John is the personification of still waters run deep. Rounding out the team are Becca Vlasik (Monique Gabriela Curnen), Scott (Michael Irby), and Rem (James Landry Hébert). Finally, there is attorney Asha Flyn (Brooklyn Sudano). Beautiful and motivated, she reconnects with Bryan at a critical point in their lives. First aired: June 30, 2018. What do you think? Have you been watching the Taken TV show on NBC? 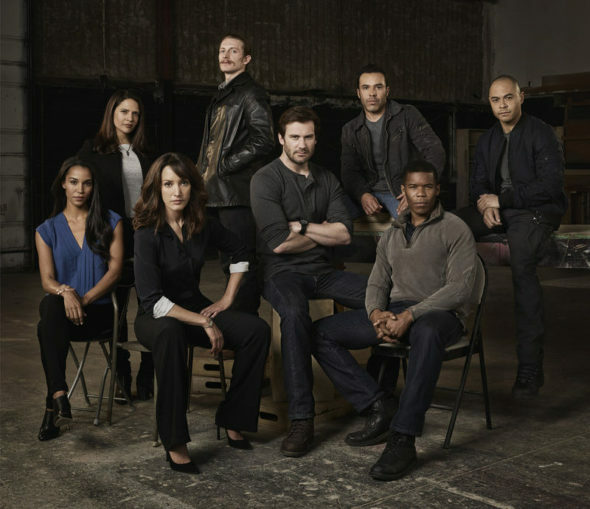 Should Taken have been cancelled or renewed for a third season? Taken: In the NBC TV Show Cancelled or Renewed for Season Two? Taken: Season Two; Will You Be Watching the NBC TV Show? Taken: Season Two; Should the NBC Series Be Cancelled or Renewed? Loved this show. It is well written with great actors. Keeps your attention and keeps you wanting to watch the next episode. Too bad NBC cancelled it. I just started watching this show on Netflix. I’m so sorry I never watched it on regular tv. It’s a very well written show. I love when they cast the right people to the right parts. Excellent show. Too bad NBC didn’t give it a chance. Same here, Allison. I thought it was a fantastic show, too. The de facto plots probably made a few folks edgy, if you get my drift. Therefore, NBC was most likely ‘encouraged’ to cancel. Just my take on it. Why do they always cancel the good shows and leave really bad ones? I really enjoyed the show! Somewhat realistic, but a good TV action drama. I miss it! Love it!! Please bring it back. Loved this show. don’t understand why it wasn’t liked. Hate to see it end. Would love to see more. One of my favorite shows. Why would you cancel it? No one in Hollywood can write a show that lasts longer than six weeks. Use it as a fill in. I hate reruns! Love it. Please bring it back. I binged watched it and it was so intense and interesting and intriguing I couldn’t stop watching. Love the series. NBC made a very decision in calcelling . There is too many junk tv shows out there that are still airing. Shows like this one is a nice break from the other junk on tv. Stop canceling good shows just to keep airing show like “Teen Moms” if I want reality I just turn the tv off.